Getting there: The regular Bulgarian airlines flight (Amsterdam Schiphol) to Sofia, the bus to the train station, the train to Karlovo (about 4 hours, quite an adventure!) and the next day by bus to Troyan (2 hours). This bus crosses the Trojanski Prohod (1525m. ), the pass, and offers you before walking already a great view at what you can see the coming days. We walked in a lower part of the mountains, more north, no snow, from east to west, with mostly great views at those higher Stara Planina (until 2376 m., at Easter completely white, all snow……). Maps: In Troyan we bought the КАРТОГРАФИЯ ЕООД-maps, scale 1:60.000. Later on we discovered also maps on scale 1:40.000 . So, using our maps we sometimes got lost. On the trail the marks are difficult to find, or just had disappeared. You have to make your own route: something special, but very worth while. 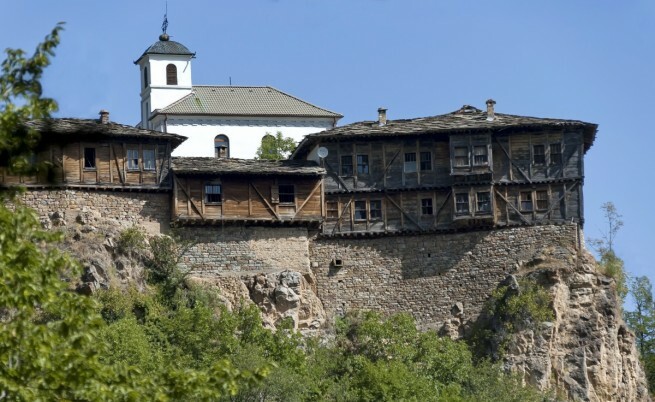 Accommodation: Hotels in the cities and villages on the route. The hotel will be pleased to advise you. Or arranges a reservation for the next night .“B&B” possibilities or “Zimmer frei” are increasing. Height on route: 400 -1300 m.
Distance between de stage cities: 18-25 km. 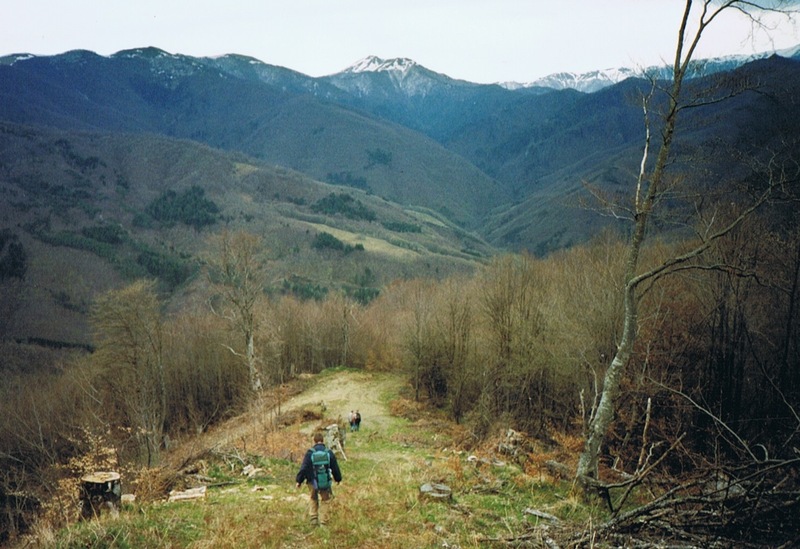 Easter 2006: a trail in the lower Old Plain region, the Stara Planina, in clear mountain air, very varied scenery and a rich flora and fauna. Day 1: Troyan* - Šipkovo..16 km. Day 2: Šipkovo - Ribarica..28 km. Day 3: Ribarica - Teteven..14 km. place to sleep. A friendly Bulgarian brought us in his car (7 persons!) to Pravec. Day 5: Pravec - Etropole..13 km. And from Etropole, by bus (85 km) to Sofia ( 2 hours). * visit the Trojan monastery, it’s not on our route, but worth a visit. On trail: The promised marks on the route were mostly disappeared. But there are a lot of friendly local residents who are willing to help you in finding the way. 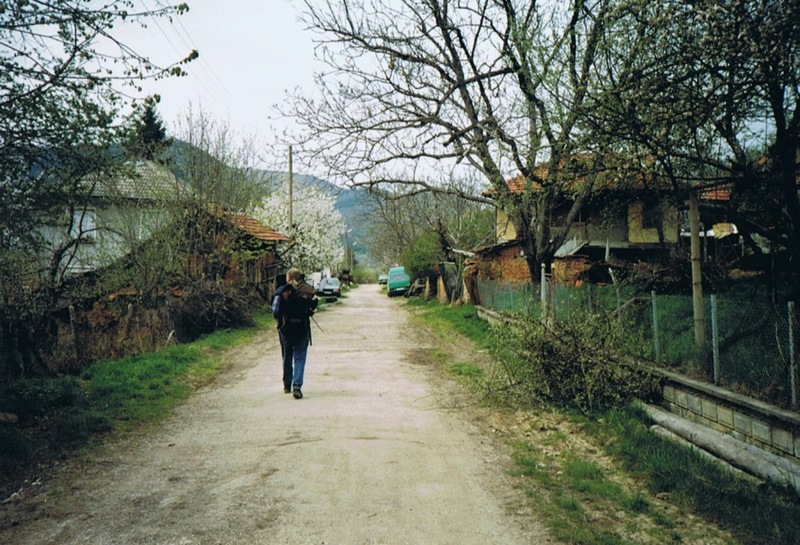 Our route went through old foot paths, on height, through villages where time seemed to be stand still during the last decades. Or passed all the “new symbols of the booming Bulgarian economy”. 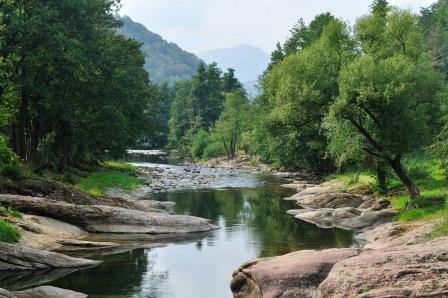 A trail along the Beli-Vit river and a heavy climb to the Glozhene monasteries with old icons and a little museum. Or - at Easter - the plum trees in full flowering (for the rakija!). 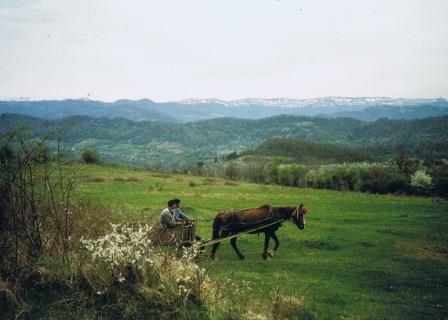 And always: the magnificent mountain look at the higher Stara Planina! Now and then a coach and horse with Roma’s on the easel. 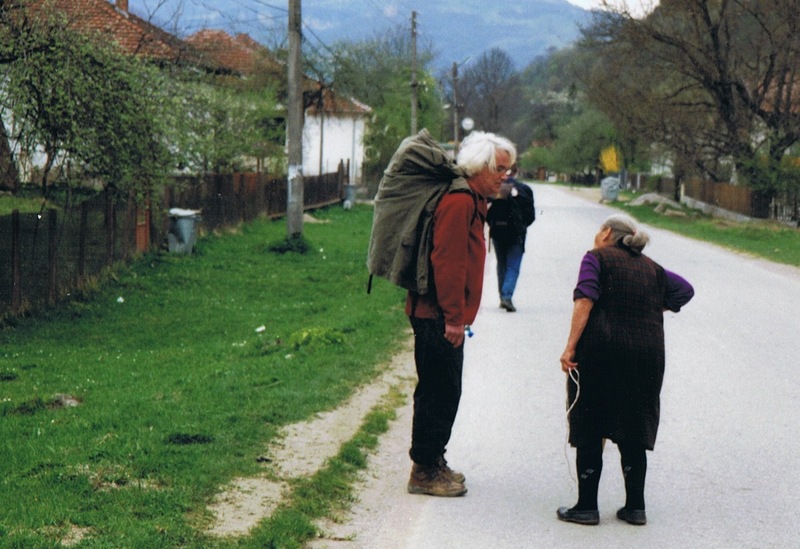 So, the trail demands a creative mind…...but offers a walker a lot………..even more than that.